• Honana Kitchen Storage Racks - Refrigerator Drawer Food Drink Organizers. • Foldable, durable and lightweight food containers..
• Smart slide design - Made from PP material..
• Have holes at the bottom for ventilation..
• Perfect for use in refrigerator shelves or under tables..
• Great! 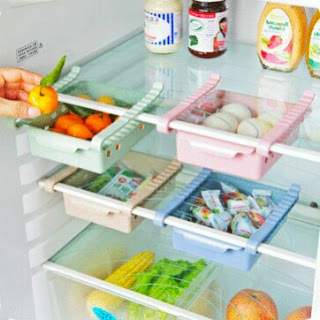 for organizing drinks, food, fruits and so on..
• Ideal space-saving storage containers..
• Colors: Transparent, Blue, Pink, Green, Beige..
• Easy and convenient to clean..
• Dimension: ~ 14.5 x 12 x 4.5cm..